Self-made fitness guru Tracy Reifkind has a self-made physique, working off 120 pounds after harnessing the extraordinary power of kettlebells (as featured in Timothy Ferriss’s The 4-Hour Body). Now, Tracy delivers a power-packed exercise, diet, and lifestyle program for rapid but sustainable weight loss: The Swing! Reifkind’s program promises dramatic results in just two half-hour sessions each week—that’s just four hours a month! There are no gimmicks here: Reifkind offers strong coaching on developing a winning mindset and a protein-focused, transformational eating plan, and reveals the evidence of her own low-cost, no-gym-membership success story. The rewards of THE SWING!, it’s fat and calories burning, lean muscle building workouts and rapid results are motivation in themselves with the goal of permanent weight-loss and the strongest, healthiest body and mind ever. At the age of 41, weighing 250 lbs., having tried every diet and workout regimen, and experiencing an ever-growing array of health problems as result of being overweight for her entire life, Tracy Reifkind turned to the kettlebell swing, and lost 120 pounds. In the six years since losing the weight, radically transforming her body and wardrobe from a size 24 to a size 6, and toning muscles she previously didn’t know she had, today Tracy Reifkind is a certified Russian kettlebell instructor, in excellent physical health, and in THE SWING! eagerly shares her body and life–altering workout with anyone looking to lose weight and get into shape. “I think about the miracle of the kettlebell each time I see my reflection in the mirror,” she writes. Boredom isn’t possible—the workouts are concentrated, the routines are varied, and the endless possibilities for combination moves yield fast results! BODY: Learn, Practice, Train (LPT) and start swinging your way to results! FOOD: learn how to feed yourself with nourishment with a weight-loss food plan and recipes for those who love to eat. 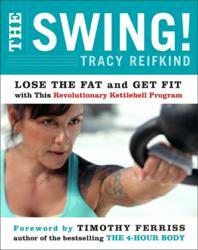 Tracy Reifkind lost 120 pounds at age 41 by doing the kettlebell swing, and gained the path to lasting results. A certified Russian kettlebell instructor since 2006, her unique training program is effective for novices and extreme athletes alike. Tracy Reifkind was featured in the bestselling book The 4-Hour Body by Timothy Ferriss, and has produced a DVD, Programming the Kettlebell swing. She lives in California with her husband Mark, also a Certified Russian Kettlebell Instructor, and their two sons.